Indian cucumber-root, Medeola virginiana, is a fairly common member of our local forests and wetlands and can be found throughout the eastern half of North America. 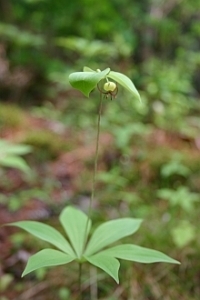 This perennial herb, a member of the lily family (Liliaceae), is readily identified by the whorl(s) of lance-shaped leaves surrounding the main stem. The leaf margins are entire and up to five inches long. The plant can attain a height of thirty inches. In a season when the plant is not going to flower it produces only one whorl of 5-10 lower leaves but when in flower, it produces a second, higher, tier of fewer leaves. 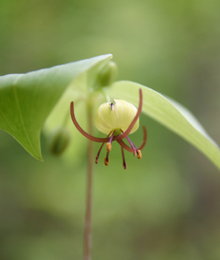 The flower is yellow-green and quite attractive, owing to the three brown stigmas that hang beneath the flower. 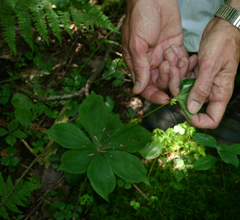 Steve Broyles, Biological Sciences professor at SUNY Cortland and past guest speaker for our organization, recently said this about Indian cucumber root after finding it in a Cortland gorge: "The flowers open underneath the upper most whorl of leaves and are hidden unless you lie on the ground. As the fruits mature from these flowers, they are repositioned above the upper whorl of leaves. The berries become dark purple and the leaves will become red to contrast with and advertise the fruits." Our regional native Americans ate the starchy rootstock which has a mild cucumber flavor- hence the common name. It is said that the peeled, raw, tuber can be used in salads. Flowering occurs in our area in May and June. Afterwards, the dark purple berries appear. 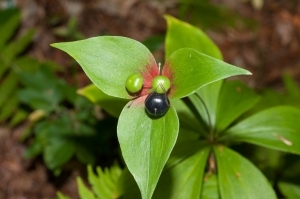 Although common in central New York, it is listed as endangered in Illinois and Florida.